The Dixon Wind golf ball can be used by all golfers with different swing speeds. Even slower swing speed golfers will enjoy extra distance in the drives. The Dixon Wind golf ball is best used by golfers with handicaps over 20. The ball has a firm cover and is more durable. 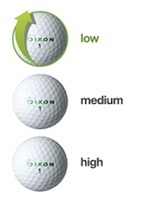 The Dixon Wind golf ball has medium level trajectory and is suitable for most golfers. The Dixon Wind golf ball has a firm feel for straighter drives and more accurate iron play.